The "nasty, negative, misanthropic" comic genius proves he has a sweet side. Cute little kittens, angels, and babies? Flowers, ice cream cones, and German boy bands? Coming from, supposedly, the creepiest and most pessimistic artist of his generation? Yes indeed, there is a "sweeter side" to R. Crumb. These delectable illustrations—whether depicting Bernie the Cat pawing for his master's affection, the timeworn beauty of a French village cul-de-sac, or a quiet night chez Crumb—wonderfully exemplify the many tender moments that have, until now, played second fiddle to the cult icon's more raunchy sketches. 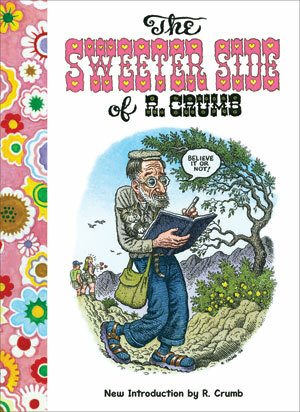 Now Crumb harkens back to his humble American beginnings as a Cleveland greeting card illustrator, when his innate knack for the grotesque had to be suppressed for the perennial appeal of "cute." The result is this cheery and blue-skied world, where readers of every conceivable personality type, age group, even sexual persuasion can finally enjoy the artist's momentary lapse from naughty to nice.